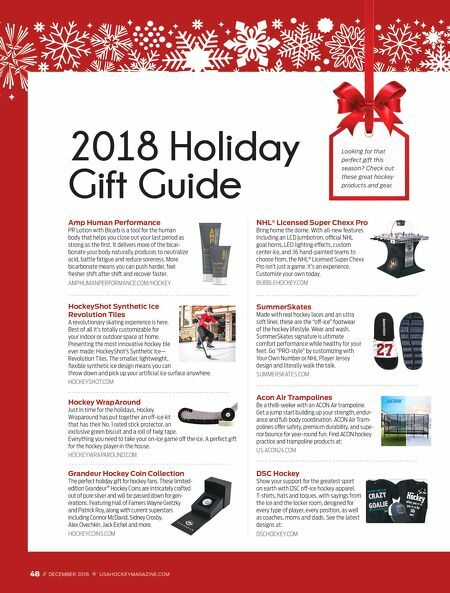 48 // DECEMBER 2018 USAHOCKEYMAGAZINE.COM Amp Human Performance PR Lotion with Bicarb is a tool for the human body that helps you close out your last period as strong as the first. It delivers more of the bicar- bonate your body naturally produces to neutralize acid, battle fatigue and reduce soreness. More bicarbonate means you can push harder, feel fresher shift after shift and recover faster. AMPHUMANPERFORMANCE.COM/HOCKEY HockeyShot Synthetic Ice Revolution Tiles A revolutionary skating experience is here. Best of all it's totally customizable for your indoor or outdoor space at home. Presenting the most innovative hockey tile ever made: HockeyShot's Synthetic Ice — Revolution Tiles. The smaller, lightweight, flexible synthetic ice design means you can throw down and pick up your artificial ice surface anywhere. HOCKEYSHOT.COM Hockey WrapAround Just in time for the holidays, Hockey Wraparound has put together an off-ice kit that has their No. 1 rated stick protector, an exclusive green biscuit and a roll of twig tape. Everything you need to take your on-ice game off the ice. A perfect gift for the hockey player in the house. HOCKEYWRAPAROUND.COM Grandeur Hockey Coin Collection The perfect holiday gift for hockey fans. These limited- edition Grandeur ™ Hockey Coins are intricately crafted out of pure silver and will be passed down for gen- erations. Featuring Hall of Famers Wayne Gretzky and Patrick Roy, along with current superstars including Connor McDavid, Sidney Crosby, Alex Ovechkin, Jack Eichel and more. HOCKEYCOINS.COM NHL ® Licensed Super Chexx Pro Bring home the dome. With all-new features including an LCD jumbotron, official NHL goal horns, LED lighting effects, custom center ice, and 36 hand-painted teams to choose from, the NHL ® Licensed Super Chexx Pro isn't just a game. It's an experience. Customize your own today. BUBBLEHOCKEY.COM SummerSkates Made with real hockey laces and an ultra soft liner, these are the "off-ice" footwear of the hockey lifestyle. Wear and wash, SummerSkates signature is ultimate comfort performance while healthy for your feet. Go "PRO-style" by customizing with Your Own Number or NHL Player Jersey design and literally walk the talk. SUMMERSKATES.COM Acon Air Trampolines Be a thrill-seeker with an ACON Air trampoline. Get a jump start building up your strength, endur- ance and full-body coordination. ACON Air Tram- polines offer safety, premium durability, and supe- rior bounce for year-round fun. Find ACON hockey practice and trampoline products at: US.ACON24.COM DSC Hockey Show your support for the greatest sport on earth with DSC off-ice hockey apparel. T-shirts, hats and toques, with sayings from the ice and the locker room, designed for every type of player, every position, as well as coaches, moms and dads. 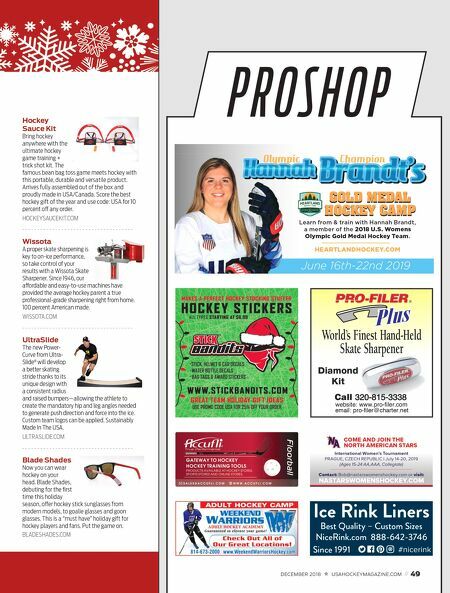 See the latest designs at: DSCHOCKEY.COM 48 // DECEMBER 2018 USAHOCKEYMAGAZINE.COM 2018 Holiday Gift Guide Looking for that perfect gift this season? Check out these great hockey products and gear.